Praise God for His provision! We are right on target for meeting the goal for March. Three puzzle pieces of the overall Preschool Building have been provided! The next milestone is April 1st and another $10,000.00 is needed to stay on track for our January 2020 completion date for the preschool building in Haiti. Please pray for God to touch hearts in the coming weeks so we can complete one row of the overall puzzle. The puzzle is beginning to take shape, but we have a long way to go. For those who have given, we PRAISE GOD for your generous gift! We just completed the second month of the YEAR TO REMEMBER CAMPAIGN. Thanks to all who gave toward the goal of adding a preschool addition to the school in Haiti. The goal for puzzle piece #2 was $10,000.00 and $5575.00 was received. The two month total is $17,315.00, leaving us just $2,685.00 short of the two month goal. Please join us in asking God to touch the hearts of people to give. The next puzzle piece goal is $10,000.00 and the faith goal to stay on track is $12,685.00. Piece #3 is due March 1st. As tax season is upon us and possible returns available, please consider making an investment in the lives of children in Haiti. Also, please consider sharing this opportunity with family, friends, coworkers, civic clubs and church members. Your gifts will help us complete the second and add the third piece of the puzzle as we continue to build the picture! We are Praising God for His provision of the first puzzle piece toward completing the Preschool building in Drouin, Haiti. The goal of the first puzzle piece was $10,000.00 and God touched the hearts of people to contribute $11, 740.00. Thanks to everyone who gave toward this first piece! Please join us in praying for Puzzle Piece #2 of $10,000.00. The picture now looks like the following. The YEAR TO REMEMBER CAMPAIGN BEGAN December 1, 2018. The goal is to raise $110,000.00 to build a Preschool Addition to the School in Drouin, Haiti. We are praying and we ask you to pray asking God to provide the financial resources to accomplish this task. As resources arrive we will post an update in the form of a piece of the puzzle until we reach the completion of the goal which is targeted for January 2020. On the first of each month for the first 9 months the financial puzzle piece needed is $10,000.00 each. The final 3 months we need puzzle pieces that represent $7,000.00, $7,000.00 and $6,000.00. On December 1, 2018 the picture we are praying to complete was a blank slate. In late June Volcano Feugo in Guatemala erupted killing many and decimating villages. From this disaster, a plea was made for repelling gear for first responders i.e. 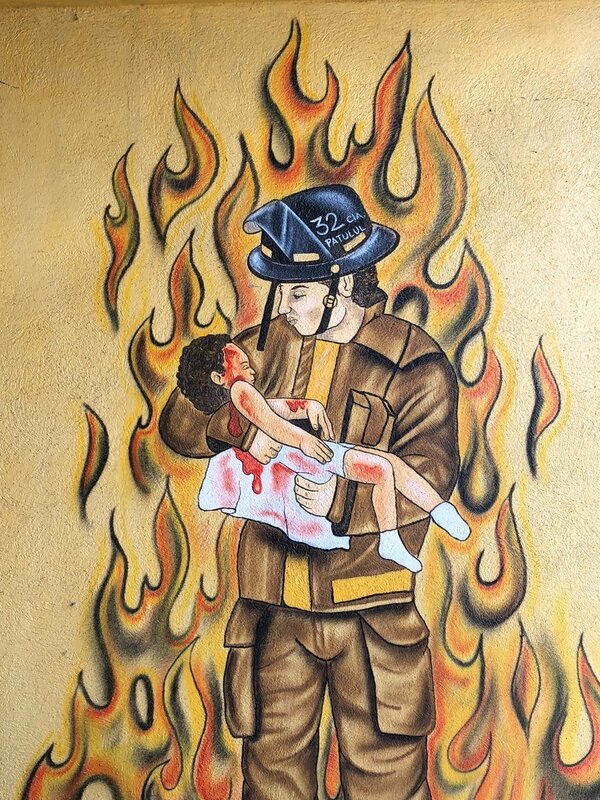 Bomberos/Fire Fighters to use in rescue situations. A request for prayer and support to purchase needed equipment was shared. Soon the financial resources began to arrive and phone calls were being answered. As the days passed, we waited on God’s provision and a plan to transport the equipment was being developed. One of the phone calls was from a local fire department desiring to provide equipment. Arriving at the fire station, it was soon discovered that they had 10 sets of bunker gear they wanted to donate. I expressed appreciation, but said that was not what we were needing at this time. Contact was made with our ministry partner in Guatemala concerning a possible need for the bunker gear. An immediate respond came, “Yes, Yes, Yes, a new fire department is being formed and ten people are in a training program right now to be certified as fire fighters.” God’s amazing timing and invitation was unfolding! 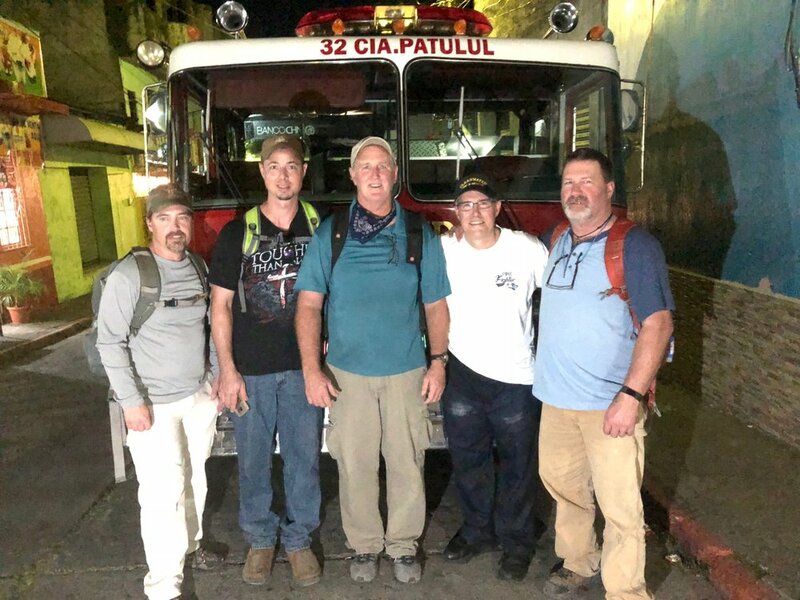 During the week of August 7-12, four men traveled with repelling gear and a desire to share life and faith with the fire fighters of this newly forming department. On Wednesday evening we had a time of sharing with the fire fighters a story of physical rescue and the personal story of how we each were spiritually rescued by Jesus Christ. The group was appreciative of the stories, the encouragement, prayer and the repelling equipment. The following day the firemen invited us to a training time with several other departments in a nearby town. The day consisted of classroom training on the nature and characteristics of fire, types of fires and some simple strategies when first engaging a fire. The classroom session was followed by a hands on use of fire hoses and handling techniques. When this session ended we returned to the fire station for a mock search and rescue operation. This was an extremely challenging task and several trainees were overwhelmed by the experience and requested removal from the drill. To say the least this was very eye opening for the travel team who observed and encouraged the fire fighters. Many contacts were made and plans are being made to return in 2019 with a team. This team will be comprised of Christian Fire Fighters who will carry the bunker gear, offer training and share the Gospel. Please be in prayer for this future team, the new department being formed and for souls to be rescued by the saving power of Jesus! FYI, the new department received their first fire call at 2:00 a.m. Tuesday morning August 14th just two days after their graduation. The fire was in a carpentry shop as part of a bigger complex which includes a restaurant we enjoyed on Saturday the 11th. The town is now extremely excited about having the new fire department and for the men and women who now serve as fire fighters. Once again God and His perfect timing were on display. What a mighty God we serve! Rockport Mission camp was a new adventure for Stepstones. Last September discussion and prayer began about leading youth groups from small churches on an adventure during the Summer of 2018. As the year progressed their were six churches that were interested. When the reality of a Mission Camp became evident there where two churches that joined together to take on the adventure. The camp began on Sunday evening June 24th with a meet and greet time followed by a short challenge and prayer time to begin our week. Monday through Thursday we rolled out early and drove to breakfast provided by Hands of Hope. Following breakfast we packed our own lunches, shared a time of devotion and headed out to minister. We arrived in Rockport for the purpose of helping people affected by Hurricane Harvey last year. The goal was to cut trees and stumps and clear debris. The plan quickly changed as we arrived to find property with up to a foot of water standing in the yard. We learned that they community had received 20 inches of rain in less than 24 hours on Thursday before we arrived. We finally found a widow lady who had lost her mobile home during the hurricane. She was in need of numerous trees to be removed and a large amount of debris to be gathered and stacked for burning. Following this job we continued to encounter properties standing in water. We finally headed back to the church for lunch and to regroup. Following lunch we divided into two groups and headed out with a plan. One group became a fence building team and over the next three days installed several hundred feet of fence for a family. The second team continued as a chainsaw team and found jobs within the city limits that only a small group could perform and without standing water. By the end of Thursday the fence was almost complete and 48 stumps and trees had been cut and stacked. Along the way we were able to encourage some in their faith, share the love of Christ through service and share the Gospel by word and deed. Each night we would gather for a time of worship through song and the preached word. Following the worship time each youth group had a time to process the service and the day. Talk and prayer has begun for Mission Camp 2019. Where will God lead and where might we be serving Summer 2019? Even better, who will join the journey? If you have any questions about participating please contact us. March 17-24, 2018 was a great week in Haiti! Six men traveled to work on the Spirit of Truth School in Drouin, Haiti. Arriving in the country on Saturday the 17th we traveled up the mountain above Port Au Prince the capital. We spent the night in a mission house next door to a boy’s orphanage. This was a special treat for me because I saw some boys(now young men) that I had meet years ago. On Sunday the 18th, the team traveled down the mountain to attend Agape Church in Petionville, Haiti. This is a church I prayed for as it formed four years ago and have attended a couple of times over the years. This church has a 6:00 a.m. service and an 8:00 a.m. service on Sundays. They call themselves a church of small groups because of the rapid growth small groups are the best way to provide discipleship and accountability. The mission of the church is Chak Moun Yon Moun translated means Each One Reach One. This church has 2000 in attendance on Sundays, now that is church growth! After the service we traveled four hours to the village of Drouin to get settled. Activity soon commenced as the children of the village heard we had arrived. There was no sitting still as soccer games and teaching the locals to throw a Frisbee commenced. Monday through Thursday the team worked alongside Haitian men to install drop ceilings in 6 classrooms, an office and a storage room. We also painted all the rooms and the front of the school. As the transformation took place over the four days, the teachers and students became more and more excited about the freshness of the classrooms and the school. Teachers from another school in the area stopped by and were in awe of the new classrooms. Some of the students from the other school asked if they could transfer schools. Many in the village began asking if we could add grade levels so their children could continue receiving an education without having to travel several hours to a different town. Tuesday afternoon a gentleman showed up at the school and he is the President of the Haitian Congress. This gentleman lives in the Grand Saline Region were the Spirit of Truth School is located. He told us this school is the best school in the region in both facility and quality of education received. That was great news and brought encouragement to all involved with the school. Praise God for what He is doing in through and around the school! Praise God for allowing Stepstones to take yet another step in sharing the Gospel through the school! There are presently 309 students enrolled in this six room school. To say the least, overcrowding is the norm. Our greatest need is to expand the school by adding a three room preschool building and hiring two more teachers. Please join us in asking God to provide the financial resources to see this become a reality! Began the year working with five churches preparing them to travel to an international setting. Two of those churches traveled to Guatemala. There were four houses built for widowed and abandoned mothers and their children. Bible Storying was done each afternoon with 25-40 children in attendance. It was a privilege in June to visit the first village we worked in around Lake Antilan. We hosted a 2 hour children’s ministry and had mothers, grandmothers and a few men PARTICIPATE in the activities. What a blessing! A special opportunity happened during the trip in June and saw fruit produced in July. 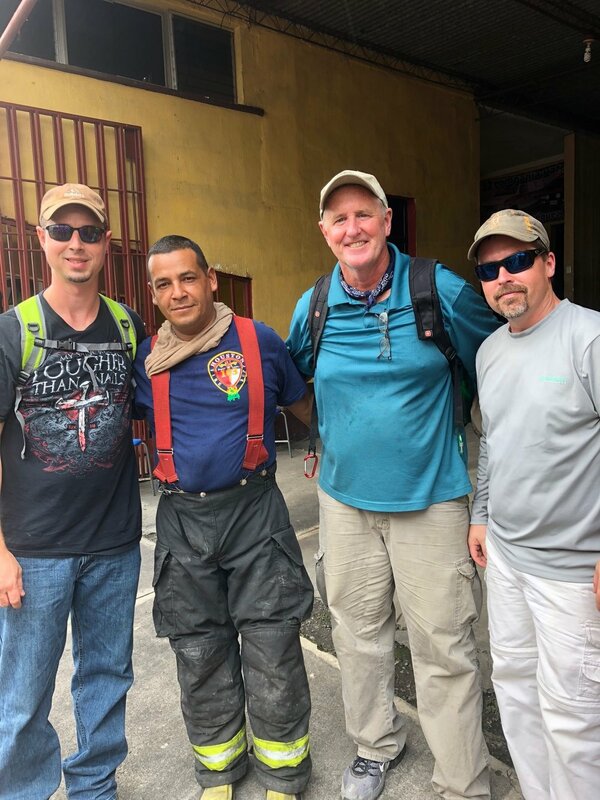 In June after ministering on Sunday night in a men’s drug and alcohol rehab center two of the men preparing to leave the facility joined us during the rest of the week as interpreters on the job sites and in translating the Bible Stories. When we returned in July one of these men worked with us again while the other recovered from sickness. During this trip we ministered in the rehab center on Thursday evening. When the service was over the two interpreters and 18 other men surrendered their lives to Christ. For a couple of years, we have been building a relationship and encouraging a pastor of a small church in the village of Chitulul. During June we were able to worship in this church and had opportunity to preach. We also discovered a house church and met the pastor and now have this second evangelical contact to develop. God continues to allow us entry in to Chitulul and deeper relationships and sharing of the Gospel of Jesus through Bible Storying is growing. Support was raised to supply education for 63 students in Guatemala. We celebrated with six of these students and their families as they graduated this past November. We have been praying and working to raise the funds to expand the school in the village of Drouin. The funds have been slowly coming in and the course is set to begin the work in March of 2018. We will continue to pray for and seek the future financial needs to complete this project. There are 350 students in the six room school. Can you say overcrowded! For the first time, in the life of Stepstones, support for eight teacher salaries was fully funded and needed no support from the general budget. We praise God for this provision! We will need new partners to achieve this goal in 2018. Met with three new churches and began a missional journey to one day lead them outside the walls of their building all the way to international settings. Preached Sunday through Wednesday Revival Services for FBC Broaddus. FYI, the five sermons are posted on YouTube under FBC Broaddus. Sorrowfully have preached two funerals. One for a teenage girl and the other for one of my former youth ministry members. Responded in Disaster Relief by taking a trailer load of supplies gathered from Center, Henderson and Hawkins to Rockport the Friday following Hurricane Harvey. Delivered a load of water to Cuero Fire and Sheriff's Departments. After unloading at the Sheriff's Department had opportunity to speak a word of encouragement and pray with two deputies and six trustees. They were very attentive and appreciative! Responded with supplies, a shower trailer, laborers, two cook teams and a refrigerated trailer filled with meat, ice and water to Sweeny, Texas. In two weeks we assisted in cleanout of 20 houses, provided a meal for the community, delivered 110 meals to refugees in an RV Park near the church. Since this time other meals have been distributed in this RV Park and the church has committed to continue outreach into this area of hurting people. Delivered 1300 pounds of frozen chicken to Rockport for use in feeding teams entering the area to assist in recovery. Assisted a church in Emory, Texas to make contact and arrangements to travel to Rockport to help in Disaster Relief. Before, during and after responding to these needs we moved offices. We are now located at 101 Hurst Street Suite 300 in Center. Local ministry continues to happen. Coaches Outreach Bible Study had 10 coaches participating in two separate groups. Four of those coaches moved to different schools during the Summer and we prayed for them and encouraged them to go as missionaries to these new fields white unto harvest. This Fall we had three coaches participate in the study of David, God’s Champion. Uncommon, a Monday night mentoring ministry for Center High School Students continues with the students becoming more trusting and willing to share thoughts and needs. There are eight men from three churches committed to investing in the lives of the students who attend Uncommon. There are other groups and businesses who provide meals. As only God can orchestrate, I was asked by the athletic director to coach the Varsity 7 on 7 summer football team. The dates of games and tournaments did not conflict with any trips so I accepted and had the opportunity to deepen the relationships with coaches and athletes. It continues to be a blessing to serve as chaplain for the varsity football, basketball and baseball teams. In October of 2007 a trip was made to a remote village named Drouin (pronounced Dway) on the west side of the country of Haiti. Drouin is located in the Arbonite Region ofHaiti. It is a 4 hour drive North West of the capital. It is the rice growing area of Haiti and is prone to flooding and extreme heat. The poverty, the lack of fresh water, the mundane diet of rice and maybe a few black beans and the lack of education opportunity made a dramatic impact. As Stepstones became a reality and incorporated in 2009, a new reality was dawning in Drouin as a school building was erected. The school has been greatly impacted by Center, Texas. Metal for the roof was donated by a local business, desks, dry-erase boards, student and teacher desks, and filing cabinets were donated by CISD. There have been men who have traveled to work on, teach at and around the school from Center. Eight teachers are presently teaching an increasing number of students. This six room school houses a little over 380 students. The class size averages around 50 students. The school day is divided into two sections to accommodate the older students in the afternoon so they can work in the rice fields early in the morning. We are well over capacity and are in a great need to expand the present rooms. The cost to expand the rooms and remodel with tile, paint, louvered windows and iron security bars will cost $21,000.00. Stepstones is in need of businesses, individuals, foundations and churches to join us in continuing to provide an education for the children in Drouin. The only way a nation can rise out of poverty is through the Gospel of Jesus Christ and Education. Every mother and father desires to see their children have a better life than they have had. This is true in Drouin as well. Children attend school for free and every day they receive a hot meal. The students are testing very high on the national tests and have high expectations. The teachers are paid $125.00 per month which is above the national average. Four more teachers could be hired if donations of $6000.00 per year were given. This can be achieved through one time donations or through monthly installments. Anyone interested in helping meet these critical needs can contact Mike Brister at 936-591-8877, email at mike.stepstones@yahoo.com or send contributions made payable to Stepstones Ministry International to P.O. Box 1988 Center, Texas 75935. All donations are tax-deductible.